A semi-documentary film by Werner Herzog comprised of footage shot in North Africa. Anchor Bay USA R0 boxset + DVD release. Fata Morgana is a visual/audio film without narrative. Werner Herzog travelled to Africa in the late 1960s with a plan for a semi-science fiction film, but on arrival there, the script was ditched in favour of a more free-form style of images which he continued to shoot while filming his subsequent films Flying Doctors of Africa (1969) and Even Dwarfs Started Small (1970). The film includes footage of mirages and lonely desert scenes, abandoned remains of civilisation and some shots of a mix of very eccentric characters in desert towns. It is presented in three parts, Creation, Paradise and The Golden Age, and set to texts from the Mayan book of creation (the Popul Vuh) and some words written by Herzog himself as well as a mix of classical music and songs. There is ultimately no purpose to the film - it is a mix of images and sounds that seems to exist somewhere between the pure nature of the art-house critic's favourite Koyaanisqatsi (1983) and the exploitative focus on the bizarre human activities of Mondo Cane (1962) and its sequels. Fata Morgana forms part of a visually beautiful trilogy with Herzog's hellish visions of Lessons of Darkness (1992) and the space-bound Wild Blue Yonder (2005). 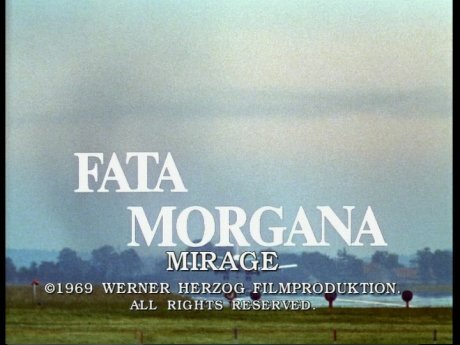 Fata Morgana is probably the most surreal and absurd of the films and it is certainly not a film for everyone - its dreamlike nature makes for an incredible sleeping pill, although the way in which it was shot means you might not realise if you have fallen asleep. Not recommended to everyone, but if you enjoy films of this type it is certainly worth experiencing. A surreal audio/visual experience, not for everyone but recommended to those who enjoy these films. The print quality is good with mild grain and some print damage. Audio German and English stereo. Both sound good and work equally well. Availability Available in the Werner Herzog collection boxset, and in a seperately released 2-disc set with Lessons of Darkness. Other regions? Anchor Bay UK DVD - no English audio. An interesting and surreal visual film, although might be too hard for some to enjoy. A decent looking print and audio. Good audio commentary.